I decided that I will "create my own sunshine". In class we closed all the blinds so we wouldn't see the rain and clouds outside and pretended it was sunny. 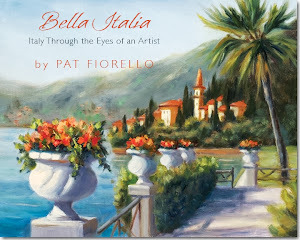 Doing this painting reminded me of sunny, warm days in Italy. So it you've got the winter blues, create your own escape to a sunnier place and time. Art can help take you there. I've been working on a complicated painting of a Venice canal scene for the past 2 weeks. I keep making revisions and I think I'm close to done but wanted to give it a break before coming back to look at it with fresh eyes in a few days. In the meantime, after taking it as far as I could this morning, I was ready to paint something easy, just for fun. In honor of Valentine's Day, I did these roses. This painting is not for sale since the reference photo that inspired it was not one I took myself, but it was a fun and freeing exercise to get back to painting something happy and expressive without worrying about straight lines and perspective. Hope you have a Happy Valentine's Day with the people you love doing the things that bring you joy! Hi , just wanted to let you know that I am being interviewed by David Cohen on his "Be the Beacon" radio show. It airs live Monday, February 11 at 10:30AM e.s.t. Or if you are not available then and would like to listen to the 1/2 hour interview, you can do so as well. In either case, simply click on Pat's radio interview. David is a brand consultant and artist himself. On his show he discusses personal branding and small business entrepreneurship in the age of social information. I'm not 100% sure of where the conversation will lead, but I hope to share what I can to have it be informative and inspiring. Back to landscapes and Tuscany. This is a view from a beautiful winery and resort, Dievole, which is one of the places I usually like to take my group when we paint on location in Tuscany. They have a beautiful garden with all sorts of flower pots and garden ornaments like this bench as well as amazing views to the vineyards and distant mountains. On a separate subject, I got a new easel last week. One of my goals for the year is to start painting some bigger paintings and I needed a sturdier easel than what I was working on to accommodate it. 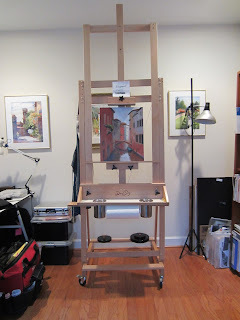 After some research and input from other artists, I decided to go with the David Sorg easel. It was designed by artist David Sorg to address issues he had with many other easels he used over the years. One of the key features is that it is counter balanced with a weight so it can move up and down without having to readjust a lot of things and remove your painting. It was delivered UPS freight in this box, you can see how large it is compared to my garage door. Fortunately ( for my husband) it was not as hard to put together as I had expected. I did have to move some furniture out of my studio to make space for it though. Here's my first painting on the new easel. For more information on this easel see David Sorg Easel. It's available from David's website directly or also through ASW or Jerry's. I was lucky enough to get it on sale at the end of the year so if you're interested keep your eyes open for a sale. In a recent class, a fellow student brought in these beautiful quince flowers. I was not familiar with that type of plant, but loved the elegance of them. Great element for a still life to create some line and movement as well as a delicate contrast to the more solid forms of the vase and pear. 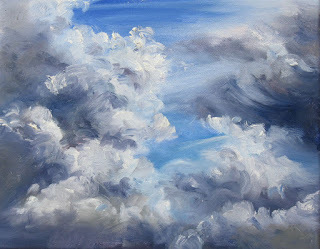 Here's a new painting I recently completed in a class. A pretty challenging set up- not only getting the form of the silver pot and roses, but suggesting the pattern and texture of the rug. Below is a photo of the still life set up.